Last week, women's rights activists, human rights organizations and individuals of good conscience around the world were outraged by allegations that women protesters in Egypt were subjected to forced virginity tests by the Egyptian army. 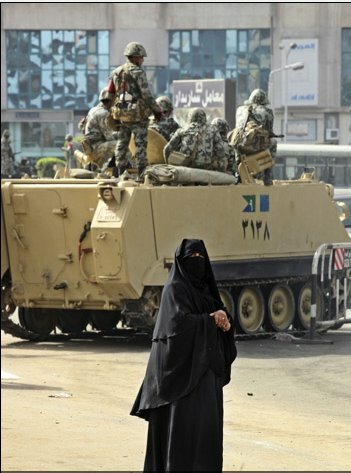 Eighteen (18) women were reportedly arrested in Tahrir square when the army stormed the historic square to clear it of protesters. The women were strip searched, beaten, subjected to electric shocks and forced virginity tests by male military personnel. A victim of forced virginity test and other forms of abuse by the Egyptian army has spoken out on camera and added weight to these allegations. In the following video, a woman reports that she was subjected to virginity test while in custody of the Egyptian army. The video was posted on The New York Times website, alongside a compelling opinion column by Nicholas D. Kristof titled, Freedom's Painful Price. The fact that these women told their stories on camera, despite the dangers involved, adds weight to the allegations of forced virginity tests exacted by the Egyptian army and highlights the urgent need for an impartial investigation into the matter. After the resignation of Hosni Mubarak, the army took over control of Egypt and promised to facilitate a smooth transition to a democratically elected government that represents and respects the rights and will of ALL Egyptians. Allegations of forced virginity tests and other human rights violations by the army undermine this promise and goes to show that Egypt under the military is not significantly different from Egypt under Hosni Mubarak. On 25 March 2011, in an email to its supporters in relation to forced virginity tests in Egypt, Amnesty International USA pointed out that "the Egyptian military may have just hit a disturbing, new low..." and urged supporters to call for an immediate investigation into forced virginity testing and other acts of torture and ill-treatment committed against women in Egypt. Please, heed the call by signing the petition. The so-called "virginity test" must be condemned in the strongest terms. My Google Analytics tells me that many people are searching online for the meaning of "virginity test" and petitions against virginity tests. This is a good sign and an indication that more people are becoming aware of the prevalence of this degrading practice. More importantly, many are willing to sign a petition against it. What's happening with the world today? When all these will cease? Unbelieveable. When it will end?